This is the section for my knife making. 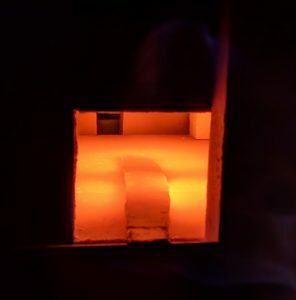 Process includes forging the raw materials (in various original forms) into rough shape, then grinding to profile before heat treating, tempering, cleaning (more grinding/sanding), buffing and then fixing handles to the blade. Custom sheaths are also available made from either leather or Kydex (heat formed). If desired, Cerakote can also be applied to the blades (before handles are attached) to further customize what you get. All blades are designed to order for the customer. No work will begin until an agreement has been reached. Pictures and descriptions of blades made will be posted here (or in subsections). For more information, or to discuss a blade you wish to have made, email me at blades@thetechpub.com. Emails will be answered as time allows (this is not my full time job). 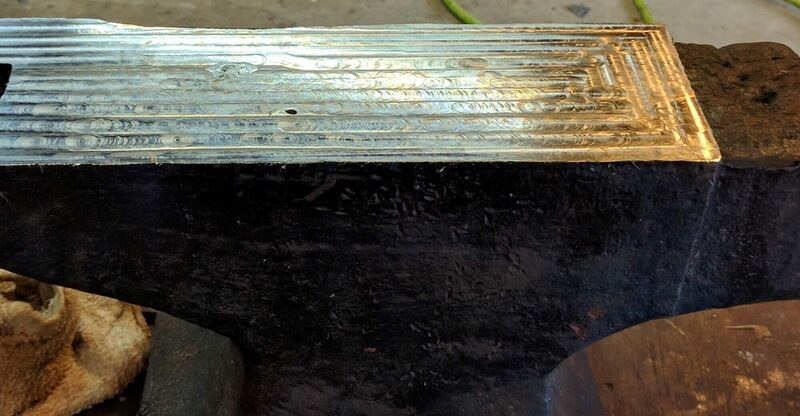 This is the anvil I received from a friend. It was his father’s anvil, since he already had one of his own (in better condition) he didn’t need this one. We machined the top (flat) surface on his Bridgeport milling machine to get past a divot that was about 1/4″ deep. This process took us about 4.5-5 hours to complete. During that time the power feed on his mill (for the X axis) started slipping since the gearbox for it was getting HOT. This forced us to use the turn handles still in place on the table (thankfully). The power geed was only slipping when climb milling (increased resistance), so we didn’t have to manually feed it for the entire job. We used both 1/2″ and 5/8″ carbide end mills along with a misting system (to keep the bits cooler) to complete this. I’m happy with the machining marks on the anvil. The surface is completely smooth, so the marking is purely visual. In the second image, you can see how I did some cleanup on the horn. Also, one of the edges has some material missing. I’ve not [yet] repaired that. I’m not yet certain if I will, since that gives it some more character. IF it becomes an issue, I’ll take care of it. I’ll need to use a hard material to perform the repair. Or look at applying another hardened steel plate to the top, with the Hardy holes in the proper position for use. This could be a task since the top surface is hardened steel. 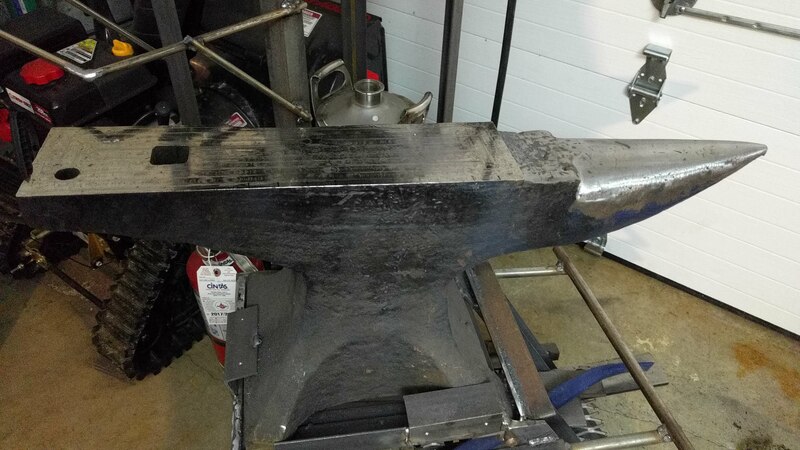 The anvil also weighs in at somewhere between 150 and 200 pounds. This is the first piece of steel to go into my forge about half way through the forging process.